The basic level of access to electricity is defined as including connection of the household to the grid and basic level of service includes 10 Amp connections. Tswelopele Municipality is only responsible for the distribution of electricity as licenced by the National Energy Regulator (NERSA) and does not provide any generation or transmission services. Tswelopele Local Municipality provides municipal services directly to some of the community of Tswelopele with others being supplied by Eskom. It is mainly Bultfontein and Hoopstad that are supplied directly by the municipality. Excluding the informal settlements there is 100% electricity coverage in the entire Tswelopele municipal area. There is no electricity coverage in informal settlements. Currently 50kWh/month free basic electricity (FBE) is being provided approximately 4606 households. 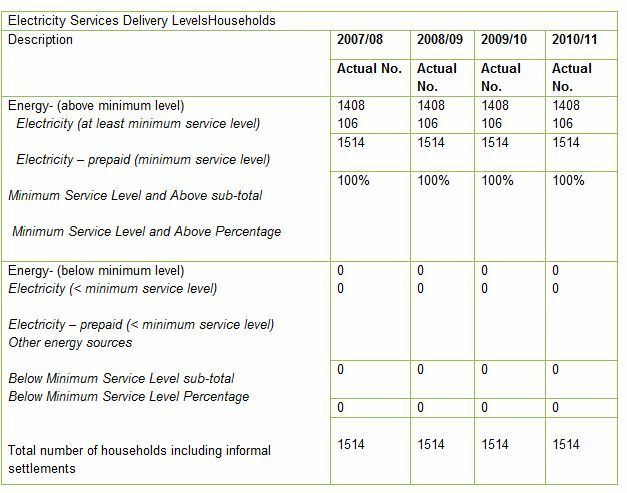 The breakdown of households receiving FBE is as follows: 106 – Tswelopele municipality and 4 500 – Eskom. The FBE provided is provided to registered indigents. FBE is funded through the equitable share allocation received from National Treasury and agreed with Eskom.